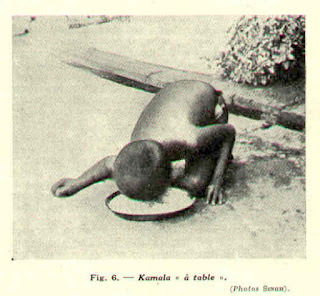 While controversy surrounds the authenticity of the account of Amala and Kamala, two feral girls allegedly found in India in the early 20th-Century, they remain one of the most famous cases of feral children. In 1926, Reverend Joseph Amrito Lal Singh published the account of Amala and Kamala, two "wolfish," feral children he claimed to have raised after their wolf mother was shot and killed. Some stories say the girls were spotted in the district of Madnipore around 1920 and rescued from a wolf's den, while others say Rev. Singh received the girls from someone who had kept them in a cage. Either way, Rev. Singh claimed he and his wife cared for the girls who ate raw meat from a bowl, and refused to wear clothes. There are dozens of accounts of feral children throughout history, going at least as far back as the 17th-Century. Daniel, the Andes Goat Boy, was found in the Peruvian Andes in 1990. It is said that he had been raised by goats for four years, and walked on all fours. "Djumba" was discovered in 1962 by Russian oil explorers, and was still crawling on all fours and biting when angered in 1991. Russians once again discovered a feral "Mowgli" boy in 2007. Amala, rescued at 18 months, died at age three. Kamala was reported to have developed a growing vocabulary of about 50 words at the time of her unexpected death in 1929. Later investigators labeled the account a hoax, saying pictures of girls acting as feral children had been staged, and Rev. Singh's "diary" forged after Amala and Kamala's deaths. But accounts state the girls had elongated jaws and canines, and their eyes shone in the dark like those of cats. Others have posited that the feral children of Madnipore, Amala and Kamala, may have been autistic.